Episode 40 - It's About Time She Swiped Right! Episode 21 - Observed Poker and How Do You Play AKs? In this episode, MTT Coach Gareth James and Mental Game Trainer Dr. Tricia Cardner tackle questions related to late MTT registration and discipline at the table. Listener Jon asked how late one should register for an online MTT when registration is open for hours. Gareth explains that how late you should register depends on a variety of factors with the most important being your skill level at various stack depths. He also covers how this applies to live MTTs. Dr. Tricia then answers a question from Daniel regarding how to cultivate discipline at the table – especially when you want to play every hand. She discusses the difference between a pro attitude and an amateur one as well as how to utilize the mantra “try to create a game that you can win.” Want us to answer your poker question? Tweet it to us: @PokerOnTheMind, @gazelligpoker or @DrTriciaCardner Download your FREE MTT Tools at: https://www.mttpokerschool.com/ Sign up for Dr. Cardner’s FREE online course called: Rev Up Your Poker Success (http://bit.ly/RevPoker) or check out my new premium course Crack the Code: Free Yourself from Procrastination (and sign up for a free trial): http://bit.ly/ProOnlineCourse. In this episode, MTT Coach Gareth James and Mental Game Trainer Dr. Tricia Cardner tackle questions regarding how wide you should call shoves at a final table when you have a medium stack. Gareth explains that it is critical to react correctly to big stack shoves when there are small stacks on the table. It would be a disaster if you busted with a 25 bb stack when there are sub-20bb stacks on the table. He outlined the top-down approach that he uses to make these decisions while at the table. Dr. Tricia then answers a question regarding the pregame warmup. She shares a 4 step process that you can use to design a personalized warmup routine. You can also use this routine anytime you feel out of sorts at the table. If you want to maintain a focused, calm demeanor, then take the time to map out your own warmup. Want us to answer your poker question? Tweet it to us: @PokerOnTheMind Get your FREE MTT Tools at: https://www.mttpokerschool.com/ Sign up for Dr. Cardner’s FREE online course called: Rev Up Your Poker Success (http://bit.ly/RevPoker) or check out my new premium course Crack the Code: Free Yourself from Procrastination (and sign up for a free trial): http://bit.ly/ProOnlineCourse Follow us: @PokerOnTheMind The WSOP 2017 Schedule spreadsheet mentioned in the episode is available at: https://www.dropbox.com/s/8f949eiqi7swl7q/WSOP2017.xlsx?dl=0. Thanks to Kenny Hallaert for putting this together. 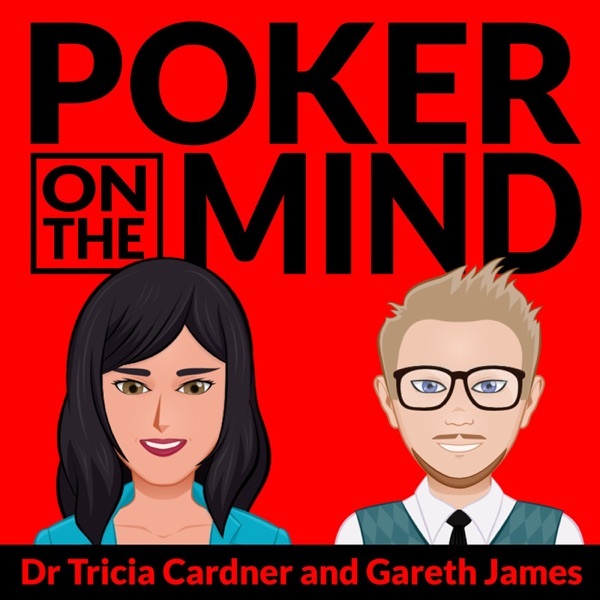 Gareth James and Dr Tricia Cardner discuss two questions sent in by listeners: one on anger, how it manifests itself in poker and how to deal with it; and the other on a specific tournament spot with AQs facing a preflop raise.